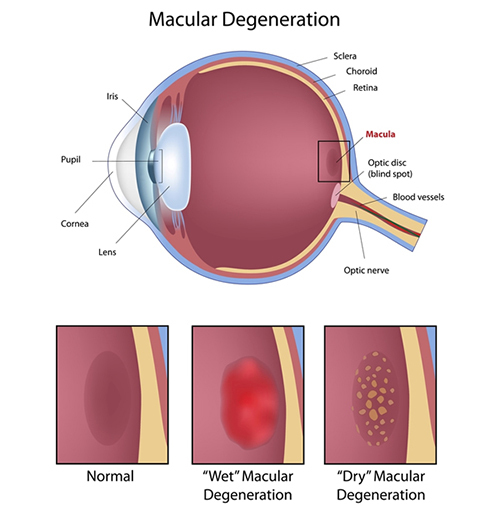 Age related macular degeneration (ARMD) is a disease that leads to a gradual decrease in the clarity of your central vision. This is due to damage to the area of your retina called the macula. The exact reason the ARMD develops in some people and not others is unknown, but research is ongoing. The risk of developing ARMD increases with age, family history, smoking, and sun exposure. There are two categories of ARMD, a “dry” type and a “wet” type. People with dry ARMD tend to have better vision than those with the wet type. ARMD is slowly progressive, and does not progress to the wet stage in all patients. In dry ARMD, waste products accumulate within your retina. In the wet type, abnormal blood vessels develop in the macular area of your retina, which can leak blood into your retina and cause scarring. Unfortunately, there is no cure for either type, but treatment is available for the wet type. In the dry stage, nutritional supplements with a specific formula developed by the Age Related Eye Disease Study are recommended, as well as sun protection, discontinuing smoking, and careful monitoring. Once it has progressed to the wet stage, there are injections that can halt or stop the progression, as well as laser treatments. A retina specialist will decide which is the best combination of treatments for your wet ARMD.